Selecting a dentist in Northern Virginia is both an exciting and a daunting task because of the amount of qualified family dentists. If you are looking for a dentist in Tyson’s Corner, VA, you might be overwhelmed by the sheer amount of dentists. However, finding a local dentist is easier than you think. Selecting a dentist in Vienna may be a good start. Vienna, Virginia is only five to ten minutes from Tyson’s Corner, depending on the traffic. In Vienna, you’ll find almost no construction. The town was built for pedestrians, so it does not provoke anxiety to walk to a local dentist appointment. In 2013, Money Magazine, of CNN, named Vienna number three in the top fifty best places to live, within American small towns. Vienna offers its visitors and residents a small town feel with a great economy and friendly citizens. Also, its has a large number of small businesses and is close to Washington, DC. Vienna is a great place for high quality business owners or businessmen and women to settle down when they become exhausted by the fast-paced business world of Washington, DC. For this reason, many talented individuals start businesses in Vienna once they start families and want to leave Washington, DC. 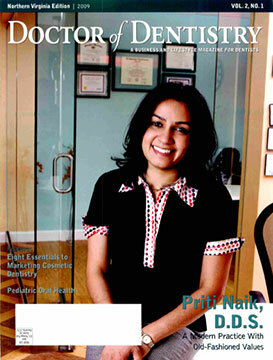 Tyson’s Corner dentists are more frequently dental specialists than family dentists. Choosing a family dentist in Vienna, Virginia, can be much more advantageous because it is a place where everyone in the family can have their teeth attended to in one place. Having one Vienna family dentist for everyone, instead of specialized Tyson’s Corner dentists for each member of the family contributes to the family’s togetherness and also saves time and gas. Dentists in Vienna carry the calm attitude characteristic of a small town into the office with them. If you choose Dr. Naik’s Vienna family dentist office, you will never feel like your appointment is being rushed because she chose an office outside of the city to avoid the rush of the city. Reviews of Tyson’s Corner dentist offices often say that the office was hard to find or that the clients did not feel that they were given the time and attention they were entitled to. However, at Vienna family dentists, these complaints don’t occur. This is because family dentists who bring their practice to Vienna have a high value for time spent with their clients and proved level of professionalism and expertise.